string(1101) "Resource Centre > Uncategorized > Modern Slavery Risks, Rights & Responsibilities"
New laws require Australian business to report on the risk of modern slavery in their operations and supply chain. The Australian Council of Superannuation Investors (ACSI) guide offers practical support to businesses on how to understand modern slavery and respond. Corporate responsibility reporting has come a long way in the last decade. Australian companies, however, still fall short of their global peers on human rights reporting. Australian modern slavery legislation necessitates a rapid response by companies yet to prioritise human rights risks. Like many human rights violations, the practices which place people in slavery-like conditions often remain hidden from view. 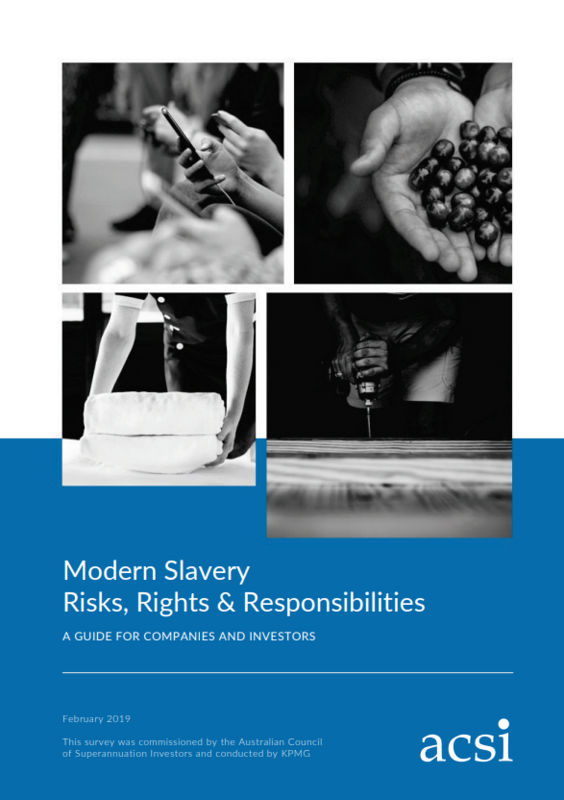 ACSI commissioned KPMG Banarra’s human rights specialists to create a guide for business and investors to better understand modern slavery – the context, the key modern slavery risk factors, sectors at high risk of slavery like practices, and the practical questions to ask to prepare a response ahead of public reporting. ACSI’s particular interest and focus is in supporting listed ASX200 companies to mature in their approach to non-financial disclosure, improve what is considered to be leading practice across corporate Australia, and facilitate conversations between investors, boards and executives as they prepare to publicly report on modern slavery risk. Investors, boards and executives will find the guidance section of the report particularly useful in preparing for the new regulatory requirements. It includes a series of practical checklists, designed using leading global practice, allowing companies and investors to make preliminary assessments of readiness to respond to modern slavery risk.